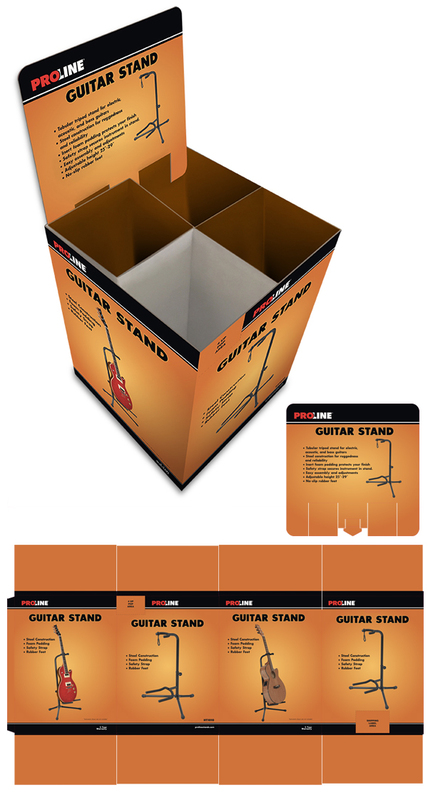 Applied Proline styleguide look across floor loader display packaging for the Proline HT1010 Guitar Stands. Floor loader holds up to 20 guitar stands, can also be used as supplemental store signage for product. Responsibilities: Inspect and suggest dieline alterations for ease of unpacking box and setting display up. Art directed photo shoot, did all of the retouching and layout required for the box and header card. Implemented the styelguide look across all floorloader pieces and prepped files for release to the printer.